Before getting started – guess what? 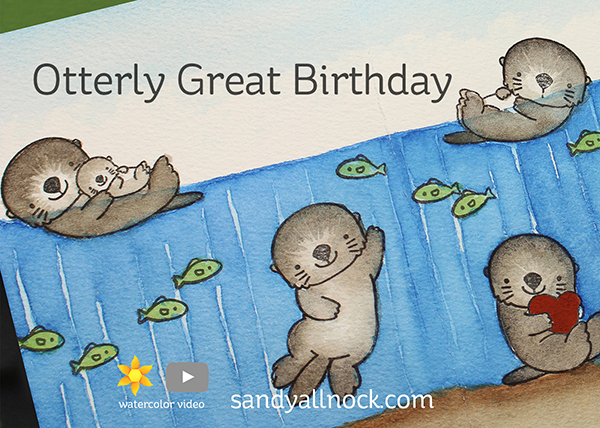 This Otterly Great Birthday set and all MFT stamps are on sale for 15% off til the 29th! Go forth and shop! Well, after you watch the video, of course. On Instagram today, I’m sharing cards using Forest Friends, Strike Up the Band, and more. 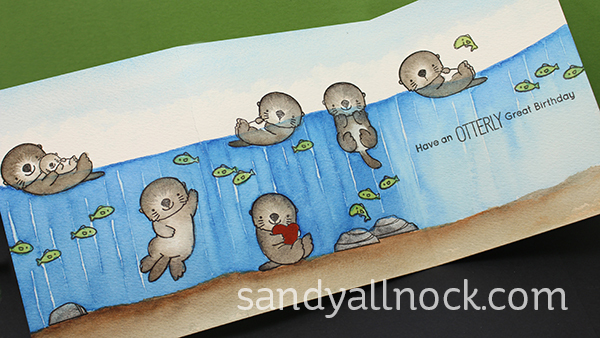 I wanted to stamp and color ALL the otters. So I did! I cut a long piece of watercolor paper – 12″ x 5.5″, then scored it at 4″ and 8″ to make three panels. Then I got busy stamping! Watercoloring the water was a blast – and I show you in the video a few ways to “recover” if your painting got funky along the way. (A few folks at CHA got to hear the backstory. Shhh! Pinkyswear! lol) Watch the video below or click HERE to see it in HD on YouTube. I love that Daniel Smith watercolor is nicely transparent – so it’s easy to make the floating otters look like they’re “in” the water. A sentiment on the front panel could be fun too, not just inside. As always, if you CASE my cards be sure to tag me on instagram to share it – I’d love to see what you create! So fun watching you watercolor. I think I need to practice patience as I try to more watercoloring. 🙂 tfs and inspiring as always! This is so cute!! I LOVE that you created a tri-fold card. Your water is fantastic. Thanks for using these stamps. So excited to see this video because these cute guys showed up in my mailbox yesterday…gee I wonder how they got there. Hi Sandy, great video! I am one of your fans who enjoys the “fix it” parts . I’m sure you’ve answered this a million times, but what ink do you like best when you’re stamping for watercoloring? Thanks! I use whatever’s been reinked freshest – versafine onyx black, Ranger jet black archival, and now Lawn Fawn’s new black ink. 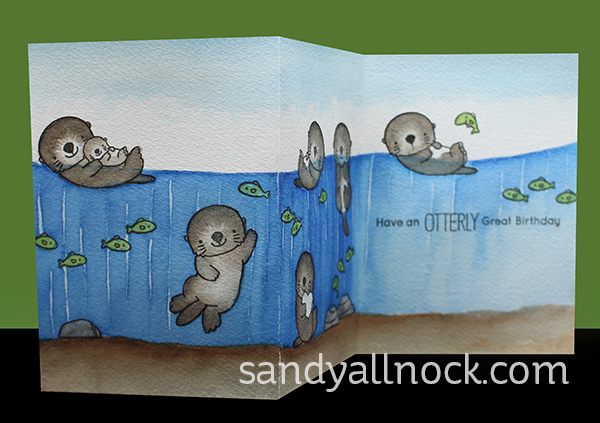 such a cute card with the otters and trifold is nice too.